is the title of a fictional poem I quoted from in a play I wrote in 1985, for a course called Theatre and Drama. I was 19. Below are the 3 lines I quoted from it. Even then, I could be pretty morose. At times fear does seem more to be the enemy than the empty darkness which beckons us to our death. Oh, foolish mortal! Can you not see or has the darkness entered your eyes? See how the fool does dare to trek across the open hand of Death. I also came across a book of compositions from Grade 5. As you can see, my penmanship and artistic skills were a little on the challenged side. If I were a mosquito I would be small and I wouldn’t bite people yet one day someone will succeed in killing me. fantastic fantastic fantastic. :) you should frame it. There's nothing bad about morose. Is your creative writing along the lines of morose? I think it is great that you have this book of compositions from grade 5. That has to be so great, reading through your thoughts then!! I like both of these poems/excerpts. 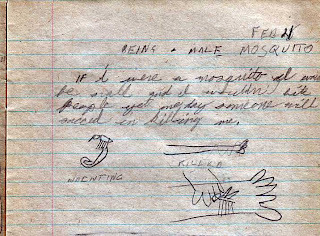 The mosquito one... wow... "yet one day someone will succeed in killing me." I would have thought it was Shakespeare if not for the word "trek". I seriously doubt it was in use when he was writing. Love the piece on the mosquito. You were clever even in grade 5! ingrid: The Darkness Macabre or my Grade 5 composition? The paper is quite yellowed and fragile. I used GIMP to improve the contrast. breal: I am not saying there is anything bad about it, just an off the cuff observation. acey: thanks! There are longer compositions, but this was short and with pictures, so it was easier to decipher. barbara: like ole Willy eh? Hmmm ... I can't remember what my frame of mind was at the time.